Spring marks the final stretch for high school seniors applying for college. For most colleges and universities, May 1 is the deadline for students to accept an offer from, and pay a deposit to, the college of their choice. While May 1 marks the end of college admissions year for seniors, it is the beginning for juniors. 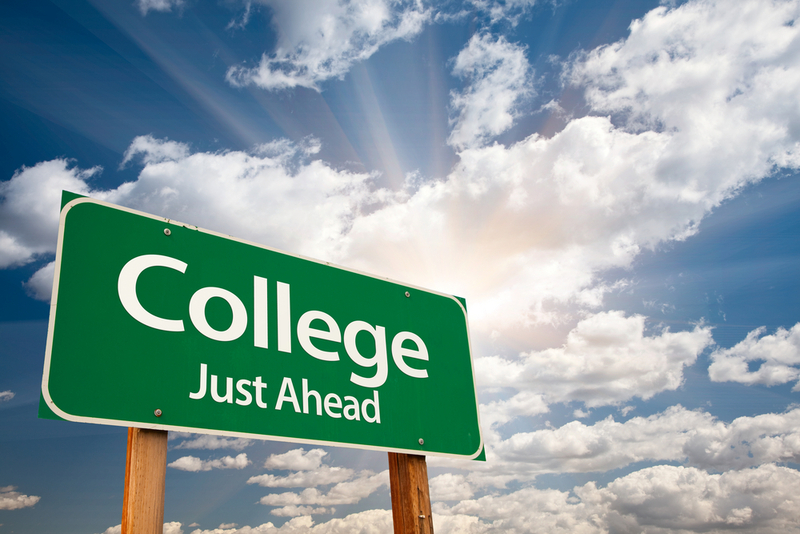 Now is a good time for college-hopeful juniors to create a timeline for the upcoming year. Sign up and take either or both the SAT and ACT before the end of the junior year, including subject area tests if applicable. If results are not to the test taker’s satisfaction, there is time for the student to retake the tests later to try for higher scores. PSD offers the ACT in late spring to all juniors free of charge, but repeat ACT tests and all SAT tests must be signed up for and paid for in advance online. Plan college visits over spring break and the summer. Take campus tours to get a feel for the schools of interest. This will help students create college lists that meet their good-fit college criteria including cost, size, location, and majors offered. Ask teachers to write letters of recommendation before the end of the junior year. Such letters are required for college application and teachers are usually inundated with requests in the fall. The earlier a student asks, the more likely the teacher will have time to write a personalized, thoughtful recommendation. Develop or tweak resumes, portfolios, audition materials, writing samples, or other evidence of talents required for college admission and/or for scholarships. If a student wants to play sports in college, start contacting the college coaches per instructions on the school website and include a schedule of the student’s athletic events for the upcoming year; register with the NCAA Initial-Eligibility Clearinghouse. Check with counselors, libraries, and community organizations for the names and addresses of possible scholarship sources. Do not slack off on academics. Grades earned during the junior and senior year are scrutinized, especially for early college applications. Students should check with the school counselor to be sure she or he has taken or is going take all courses required by schools of interest, or at least what is required by in-state schools. 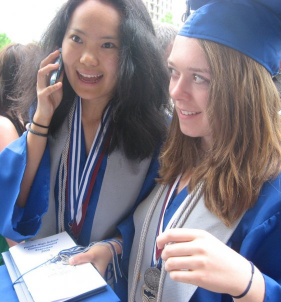 Colleges look favorably upon students who continue to take challenging courses through the senior year. Students should consider applying for summer internships, pre-college programs, or community service opportunities to learn and boost their resumes. Or they should apply for summer jobs to gain experience and earn some extra college cash. Probably the most difficult task is to get started on those college entrance essays before the end of the summer. Those that do will have a head start on the application process. Maybe the easiest task: Seek out current college students and ask about their experiences and what they recommend to make the college years successful. Ferah Aziz is a college coach with launchphase2. Visit www. 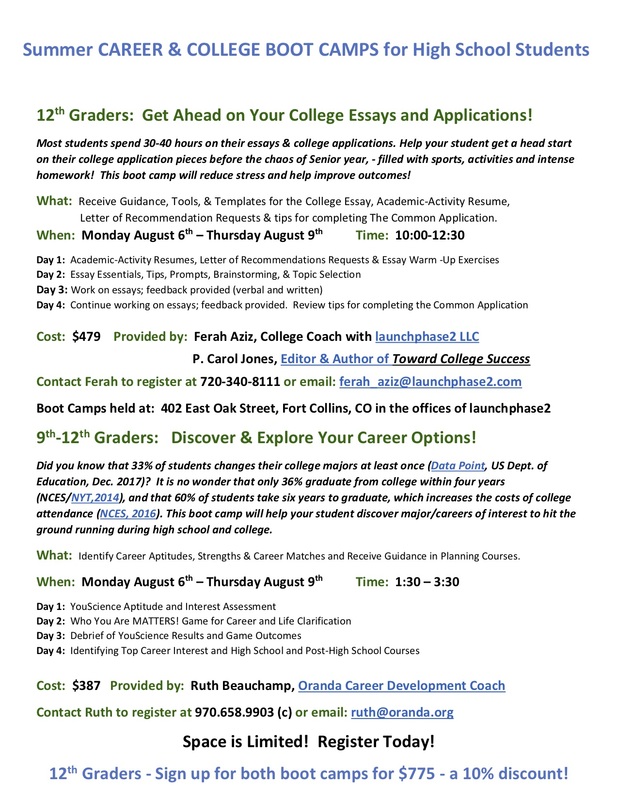 launchphase2.com/ or call 720-340-8111 to learn more about coaching for college-bound students, and success coaching for college students. P. Carol Jones is the author of “Toward College Success: Is Your Teenager Ready, Willing, and Able.” Visit www.towardcollegesuccess.com to read excerpts and to follow her blog.